Amazon had lit the Kindle Fire with the hopes of blazing into the booming tablet market. While it has been largely successful (the second largest selling tablet after the iPad and the best selling Android tablet so far), an unlikely victim of the raging Amazon Fire has been its very own stable mate, the Kindle Touch. In fact, Amazon is already reported to have scaled down on it Kindle Touch production plans in view of diminishing demands for the Kindle e-reader. The trend though shouldn’t be too unexpected, for what you get from the Kindle Fire is a tablet device with a vibrant full color display. The Kindle Touch, with its rather drab e-ink display, seems to be running out of favor with the e-book reading section as well as Kindle loyalists, even though the Kindle Touch costs less than the Fire and also has a better battery life. However, it’s not just the Kindle Touch that is feeling the heat from the new breed of low cost tablet devices (such as the Nook Color or the Kobo Vox). What these devices offer are most of the tablet market’s available features, if not all, and they won’t leave consumers’ pockets battered and bruised. Color e-ink displays are available, though LCD based displays that these tablet/e-readers sport still has an edge with better color reproduction qualities that color e-ink displays are not capable of right now. As such, the future may well belong to the LCD based low cost tablets and e-readers unless e-ink comes up with something more vibrant. However, e-readers are not alone in seeing a reduction of sales compared to tablets; the traditional PC market seems to be shrinking as a fallout of the tablet effect. In raw figures, sales of PCs to tablet devices were a strong 20 to 1 in 2010. Just 2 years down the line, the gap has narrowed down to just 6 PCs sold to every tablet PC. 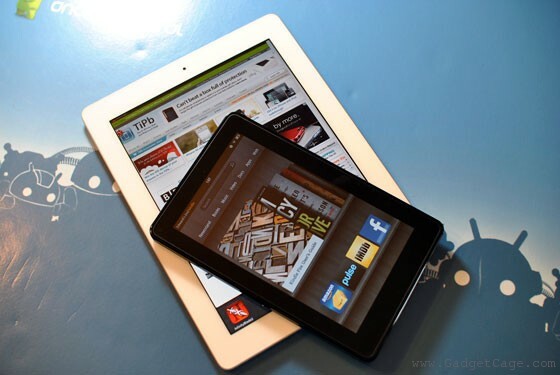 While PC sales remain largely stagnant, the tablet market has grown by leaps and bounds. In fact, tablet could be seen marching ahead of PCs by 2013. “Tablets are on fire, there’s no question about that,” said Brad Silverberg, former Microsoft executive, who is now a venture capitalist in Seattle. Apple, the one company that has had the biggest gain in the tablet segment with its iPad though isn’t amused at the proceedings. “From the first day it shipped, we thought — not just me, many of us thought at Apple — that the tablet market would become larger than the PC market, and it was just a matter of the time that it took for that to occur,” said current Apple CEO Tim Cook though his predecessor Steve Jobs too shared the same vision. However, while tablets will continue to find favor among consumers, tablet still cannot be considered a replacement of the PC. Tablet devices may score on portability and ease of use, though it’s still focused more on content consumption than content creation. Until that changes, PCs will continue to be relevant even though they might not have the strength in numbers they once had. And another article from goodereader mentioning LCDs displays being superior to E-Ink. I’ve used my computer less and less as the months wear on. With decent software and more comfortable keyboard configurations becoming available on tablets, there isn’t much reason to NOT use it for menial office work. I’ve got ThumbKeyboard and OfficeSuite Pro, and I can do everything I need for the office without being tied to a desk. If I was editing movies, ripping audio, or working with digital rendering or even photo manipulation, I would certainly need a PC. It’ll be a long time before a tablet can replace those. I do love my PC. e-ink is superior for reading. Fiction books do not have any color content anyway. Read on an e-ink reader, browse the web and play on a tablet, work on a PC/laptop.